If you watched the Puppy Bowl on Animal Planet on Super Bowl Sunday, hopefully you saw a commercial for Faulkner-Subaru commercial (Harrisburg market) that Olympia was in. Faulkner-Subaru teamed up with Susquehanna Service Dogs to make a fun parody of the real Puppy Bowl. 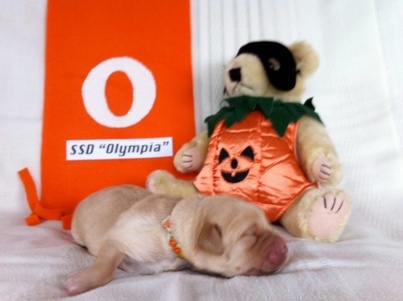 Olympia is the cute fluffy puppy in the trademark orange collar. Link to commercial is below.